Submitted by Gina Fleming, O.P. (July 16-21, Toulouse, France) They came on pilgrimage to the place where St. Dominic lived and ministered. They wanted to walk along the same paths that Dominic walked. Twenty three countries were represented at the meeting. Andrew Abberton (Present President DYAUSA, LI, NY ), Sean Mundy, (past president and member of the International Commission), Orlando, Fla and his friend Robert Schein, Kevin Sullivan, (past president of DYAUSA, former member of International Commission, and his new bride Leslie) from Madison, WI., S. Mary Soher, OP (Associate Director DYMUSA and Director of the National HS Preaching Conference), Adrian, MI, Sr. Lenore Toscano, OP (Amityville Congregation), and Sr. Gina Fleming (Executive Director DYMUSA, Director of National College Preaching Conference and Dominican Young Adults USA, Amityville, NY), represented Dominican Young Adults from the United States. The Conference began with liturgy at the priory of the French Dominican Friars welcoming all the participants to Toulouse. This, of course, was followed by dinner and wonderful conversation. The following morning we would leave for Fanjeaux. There was an excitement in the air as we arrived in Fanjeaux. We were quickly separated into smaller groups and given descriptions of the places we were to visit. First was the chapel, followed by Dominic’s house, the church in Fanjeaux and finally the “Seignadou” (sign of God). This was the area that was most touching to the young people. They looked out over at the rolling hills of Fanjeaux and were directed to look for Prouilhe, the first foundation of the Order. We spoke, prayed and contemplated about this beautiful place and how Dominic must have felt when he came to this revelation. After reading the excerpt about each we were given time to contemplate the significance of these places in Dominic’s life. Several times during our tour you could hear the young people say “this is where Dominic walked, we are walking in the same footsteps as Dominic.” After attending mass in the chapel of the convent, having a luncheon feast provided by the people of Fanjeaux and being entertained by the locals we were on our way. Our next stop was Prouilhe. We walked the four miles to the monastery singing, praying, and just taking in the scenery. Once there we enjoyed a presentation given by the community of sisters at the monastery and then broke into small discussion groups. The sisters shared their life experience at the monastery with us speaking about the community’s founding and how it has now become an international community. We then attended vespers with the sisters and afterwards were treated to a wonderful dinner composed of homemade treats. After long goodbyes on both sides, it was time to go and we again readied ourselves for the walk back to Fanjeaux. Once arriving back in Fanjeaux we were treated to a cultural festival complete with native songs and dancers. The night was upon us and it was time for sleep for tomorrow would be a very intense day. Rising the next day, we participated in morning prayer at the “Seignadou” then it was off to Montreal. This would be a (10 mile) walk filled with prayer and contemplation. 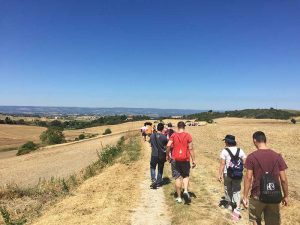 We would walk a distance, stop and pray (as Dominic did) and then continue on our journey. In total we stopped four times as we walked the path of Dominic towards Montreal! Upon arriving in Montreal we gathered in the church there to speak about the journey. How was it for you? Did you find the walk contemplative? Do you now have a better sense of how Dominic felt during his travels? We had lunch, and then readied ourselves for our next stop, a brief stop in Carcassonne, and then on to Toulouse once more. Thankfully, we had the rest of the night to ourselves. The next morning we headed to the friary in Toulouse for a study day. S. Mary Soher and I had the privilege of making the main presentation to begin the day. The topic was “Preaching as Dialogue.” After this initial session we went to break out sessions on how to use communication (websites, etc. ), social media (email, Facebook, twitter, Instagram, etc. ), and photography to preach in our world today! That evening, we spent time learning about the other young adult groups (through posters and such) that were present and what they are doing in their particular countries. It was very clear after looking at the different displays by the countries that the International Dominican Youth Movement is alive and well and very active! A highlight of the day was a visit from The Master of the Order, Fr. Bruno Cadore via video conference. Fr. Bruno was in Bologna at the chapter for the friars but insisted on connecting with the participants of the Youth Movement. 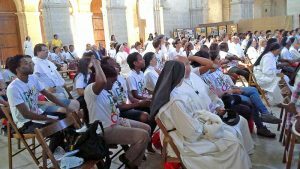 He spent an hour in a question-and-answer session with the young adults listening to their questions and suggestions about how they would like to participate as part of the Dominican Family. It was a real treat for the young people to meet him. The next day we began in the house of Peter Seilan, where Dominic established the first convent of friars, and moved on to the Church of the Jacobins where the friars had their first chapter. It is a beautiful monastery with picturesque inside gardens and many displays speaking of the origins of the Order. We finalized our trip with a liturgy (said in 4 different languages) celebrated at the tomb of St. Thomas Aquinas. Our final night had come, all of the countries set up their displays in the outdoor courtyard and the fun began. Each country used their display to highlight their culture. All had different food, drinks, and souvenirs that they would share with the entire group. Then each country did a presentation usually involving dancing, singing or in one case bullfighting. It was a wonderful way to end our time together and to really appreciate the diversity of the group! 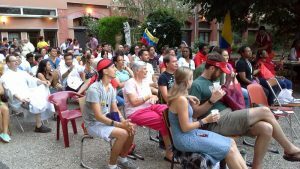 From the first day of the gathering, as groups waited for each other to arrive, a Dominican spirit of hospitality prevailed. During breaks and at meals short phrases and sign language transcended any language obstacle. Smiles and laughter could be seen everywhere as we helped each other understand each other. As groups said farewell to each other there was a sense of having bonded in an even greater way. The pledges to be in touch were heard everywhere . . . And I am sure we will! Following this gathering, a representative from each of the countries met to continue to work of IDYM in a more formalized manner. They reflected on the realities in their own countries as well as the past few years of the movement. In their discussions goals were set to help unify the youth movement amongst participating countries in an effort to support each other and grow over the next years. 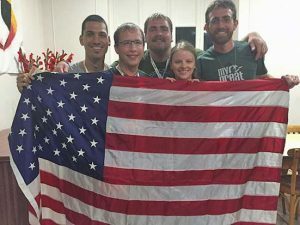 We were blessed to have our DYA president Andrew Abberton represent the USA at the assembly.